[S.I.] : St. Martin's Press, 2018. 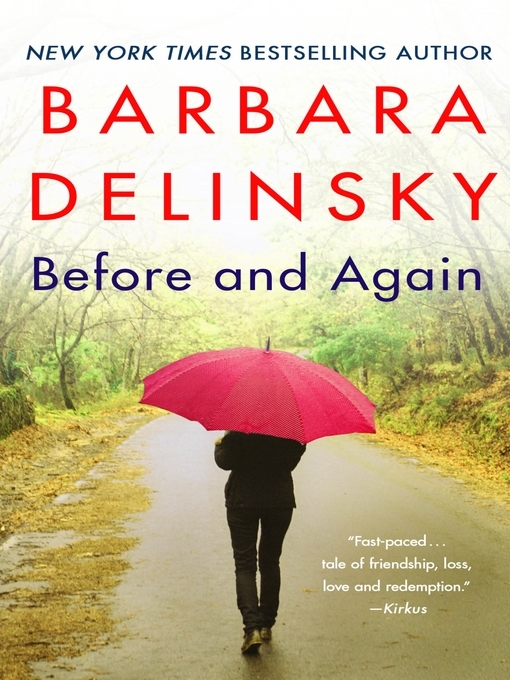 From Barbara Delinsky, the New York Times bestselling author of Blueprints and Sweet Salt Air , a brand-new novel about a woman in hiding finding the courage to face the world again. Mackenzie Cooper took her eyes off the road for just a moment but the resulting collision was enough to rob her not only of her beloved daughter but ultimately of her marriage, family, and friends—and thanks to the nonstop media coverage, even her privacy. Now she lives in Vermont under the name Maggie Reid, in a small house with her cats and dog. She's thankful for the new friends she's made—though she can't risk telling them too much. And she takes satisfaction in working as a makeup artist at the luxurious local spa, helping clients hide the visible outward signs of their weariness, illnesses, and injuries. Covering up scars is a skill she has mastered. Her only goal is to stay under the radar and make it through her remaining probation. But she isn't the only one in this peaceful town with secrets. When a friend's teenage son is thrust into the national spotlight, accused of hacking a powerful man's Twitter account, Maggie is torn between pulling away and protecting herself—or stepping into the glare to be at their side. As the stunning truth behind their case is slowly revealed, Maggie's own carefully constructed story begins to unravel as well. She knows all too well that what we need from each other in this difficult world is comfort. But to provide it, sometimes we need to travel far outside our comfort zones. From a multimillion-selling master of women's fiction, Before and Again is a story of the relationships we find ourselves in—mothers and daughters, spouses and siblings, true companions and fair-weather friends—and what kind of sacrifices we are or aren't willing to make to sustain them through good times and bad. In her deeply moving latest, Delinsky (The Woman Next Door) follows one woman's journey of self-discovery as she learns to face the ghosts of her past. In a moment of distraction, Mackenzie Cooper accidentally ran a stop sign and caused the death of her five-year-old daughter, Lily, as well as the demise of her marriage. Shortly after, she moves from Massachusetts to the quaint town of Devon, Vt., where she goes by Maggie Reid, and, having abandoned her sculpting career, works at the Devon Inn and Spa as a makeup artist. She is constantly reminded of the accident by the scar on her forehead, which she carefully conceals, as well as the frequent meetings with her probation officer following her high-profile criminal conviction. Despite her probation officer's warnings to distance herself from suspected criminals, Maggie provides emotional support for her friend Grace and Grace's son, Chris, who is arrested for computer hacking. Maggie's involvement thrusts her back into the media's spotlight. Her reinvented life is further threatened when her ex-husband, Edward, moves to Devon and buys the Devon Inn. Delinsky's novel expertly explores the depths of Maggie's guilt and redemption, as she learns not only how to find closure from the tragedies of the past but to forge a future in which she can forgive herself. This is a rewarding, emotionally intense novel. 250,000-copy announced first printing. (June) © Copyright PWxyz, LLC. All rights reserved.